~John Simon, New York Magazine . The Musical of Musicals (The Musical!) is, you guessed it, a musical. 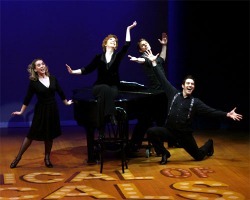 Not just one singular Broadway sensation, but five. 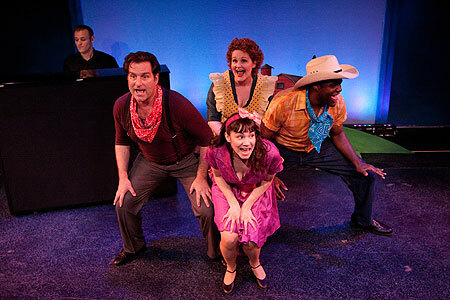 One story is told in five different musical theatre styles. With entirely original music and lyrics, the work of Rodgers and Hammerstein, Stephen Sondheim, Jerry Herman, Andrew Lloyd Webber, and Kander and Ebb is sent up in this loving satire. Before hitting the big time, the show began off-Broadway, as an instant hit at the York Theatre. After moving to the New World Stages, The Musical of Musicals played over 500 performances. It earned five Drama Desk nominations, as well as Drama League and Lucille Lortel Award nominations for Best Musical. After playing on London's West End, it has since had productions in theatres from coast to coast, as well as in Canada, Germany and Australia. and Alli Mauzey as June.